Every girl is unique, talented, and lovable. . . .Every girl is BEAUTIFUL. BEAUTIFUL breaks barriers by showing girls free to be themselves: splashing in mud, conducting science experiments, and reading books under a flashlight with friends. This book will encourage all girls to embrace who they are and realize their endless potential. This picture book is beautiful in its depiction of girls. While not really a story, there is much here that is well worth sharing and discussing with both boys and girls. The text talks about the things that make all girls beautiful. 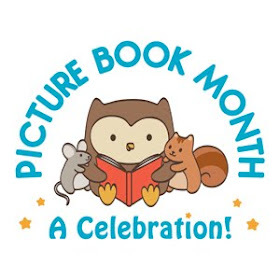 The illustrations take it a step further by showing girls doing things they love that stereotypes would say don't match the text, such as playing pirates (knowing how to use makeup) or swinging enthusiastically on their tummies while singing like songbirds. The illustrations are full of girls who are smiling and enjoying their various activities in ways that debunk stereotypes, such as a girl building an electronic car, playing in a pond, and skateboarding. The wide-variety of different girls is also a great thing, girls of all colors and abilities (including girls in wheelchairs playing basketball). One of my favorite illustrations shows a girl in a princess crown, necklace, and crown, who when her back is shown is also carrying a sword. 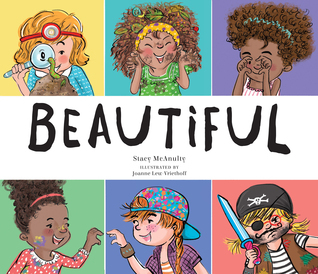 This is a book that I think should be shared with children of all kinds to show that beautiful is only as limited as we let it be. In my opinions this one is a must have for all sorts of collections, not just libraries. I love the concept and especially that wonderful cover!